Edit Syndicate proofreads academic documents and essays following MLA, APA, ASA, AMA, Chicago, CSE, Turabian, and AP writing styles. Edit Syndicate can edit most written documents in most formats, including Microsoft Word, Excel, PowerPoint and Portable Document Files (PDF). Edit Syndicate is extremely selective when hiring editors. Our staff of expert editors has passed a comprehensive proofreading test. We do not have hundreds of faceless contract editors; Edit Syndicate employs a small staff of editors, and each is highly respected in the industry. We are confident you will be 100% satisfied. If you are unhappy with your edited document, we will re-edit your document gratis. 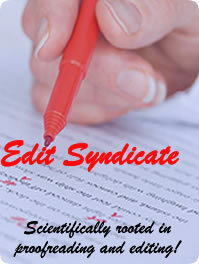 Edit Syndicate guarantees the security of your business document. Documents travel over our encrypted network, and are destroyed after thirty days. We take every precaution to ensure your total privacy and security. Edit Syndicate proudly awaits the opportunity to serve your proofreading needs!